Full Width Black Front Winch HD Bumper (FBCS1-02) by DV8 Offroad®. DV8 Off Road truck bumpers are built with abuse in mind. DV8 bumpers are tested and proven in the desert, heavy off road recovery, and utility. 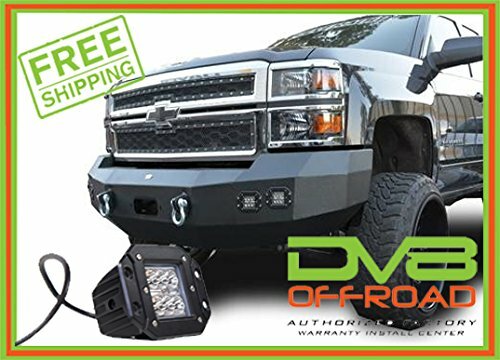 All of DV8 Off Road front bumpers accommodate a 12,500lb winch, come with 7/8" D-ring shackles, and have holes for LED lighting. DV8 bumpers are made from 3/16 cold rolled steel with ¼"+ gusseting and mounting points. Every DV8 truck bumper comes with DV8’s exclusive wrinkled 20 step powder coat. This finish looks great, is extremely durable, and is highly UV resistant. DV8 bumpers are 100% bolt on. When you’re tired of banging up your trucks thin fragile factory bumpers, DV8 has you covered. If you have any questions about this product by DV8, contact us by completing and submitting the form below. If you are looking for a specif part number, please include it with your message.